The Komul Rebab is basically the same as the Dolan Rebab, but its structure is different. It consists of a head, a long neck with frets on it.The lower part is wider and there are 12 strings on it . 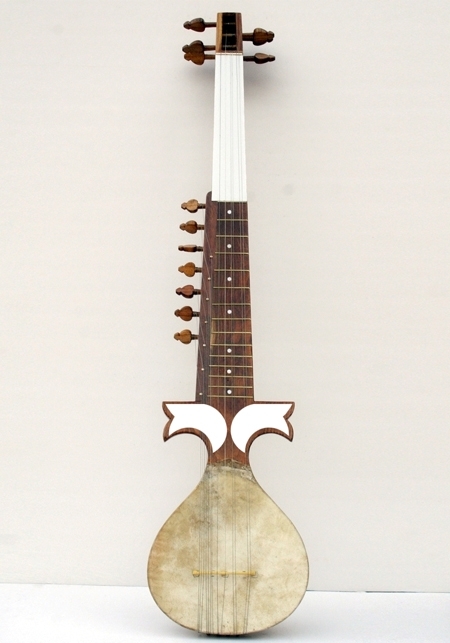 The Khomul Rebab is usually made of mulberry. It has an oval-shapped head. The diameter of the head is between 20 and 23 cm.It is about 85cm long. The face of the Khomul Rebab is covered with cow-skin and metal strings are used.The first six strings are mainly used for playing and the rest are used as sympathetics.While designed for a professional musician, the artisanal craftsmanship and beauty of the Khomul Rebab will appeal to all art collectors as a beautiful and traditional piece.Product Details:Length:80cmNumber of strings:12Includes:A muqam poster .Shipping:Please allow 20-30 days for priority shipping, express shipping options are also available.Every Rebab is packed in a custom-built wooden box to ensure safe arrival.